I never was much of a joiner as a kid… rules and stuff have always made me chafe. :~) Therefore, I wasn’t in the Girl Scouts, and so I’ve never known the validation that surely must come from earning those badges. (Am I crazy or didn’t there used to be sewing badges? Did they get replaced with ones like Netiquette? Not that netiquette isn’t important, mind you…) Okay, so these musings have precisely nothing to do with this blog post, except for being what the word “scout” brings to mind for me. 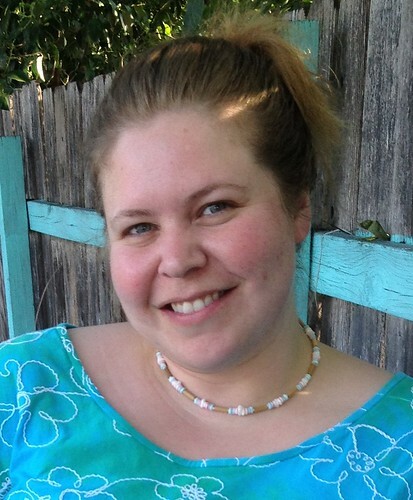 Have you seen Grainline Studio‘s pattern for the Scout Woven Tee? I have to admit that the first time I saw this pattern (months ago), I did not immediately recognize the value. Would I like to have a super-simple pattern for a basic woven top in my arsenal? Naturally, but did I really need to buy one? Surely my pattern stash had something that would qualify. And I wasn’t all that convinced that a dartless *insert anything woven here* would work on me anyway. Then, I saw a friend wear it. I couldn’t believe there were no telltale ill-fit lines or anything, even though she has a full bust as I do. I had to try it. 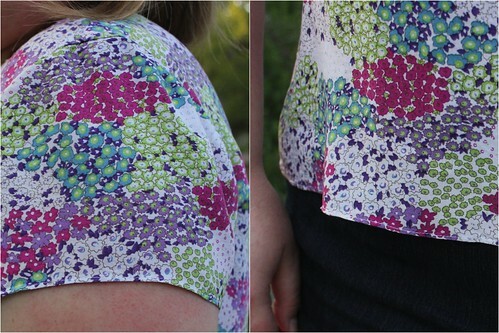 My first top shown here was made from a floral rayon challis, purchased from Fabric.com this past spring. It finally worked! I still find this fabric exceeding difficult to cut and sew, but it feels so great to wear that it’s worth it. By the by, this was the same fabric that I initially tried to cut for my first Taffy. Therefore, due to the resulting yardage limitations, my top has a center back seam — where the print somewhat matched, miraculously and unintentionally. I couldn’t have matched it nearly so well had I been trying. As far as fitting goes, I started with a size 18. The bust measurement for this size (44″) matches my high bust, which is how I choose my size with just about all pattern companies, since it usually fits my shoulders well. It turned out to be the right choice — the shoulders were perfect. Then, I did a 4″ full bust adjustment, graded out some more at the hem (hips), and added 1″ of length to both the front and back pieces. That’s it! 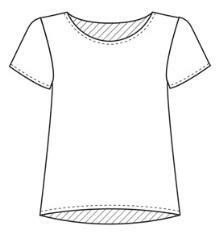 Very easy and fast, as far as alterations go for me. I ended up finding the extra length unnecessary and removed it from my pattern after making this one. I used baby hems throughout. I learned this technique from a friend, but the closest tutorial I’ve found online is here. Consider that a PSA for staystitching, folks, as if you needed one. Ah well. Some of you may have noticed a variety of technical issues with my little site this past six weeks or so. These issues have played no small part in the lack of new posts during that time period, as well. I’m hoping, fingers crossed, that it has been resolved at this stage. I apologize for any errant feedburner emails or jibberish stuff you’ve encountered. Frustrating! The top looks great on you. What a fabulous fit. 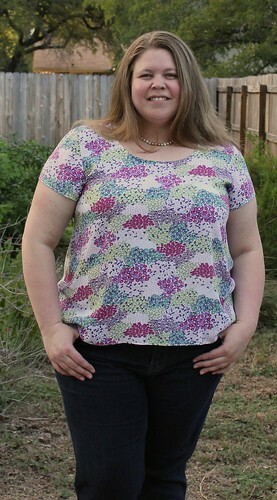 I wasn’t convinced by the Grainline top patterns but finally caved and bought them. I make the Tiny Pocket Tank and I love it more than (dare I say it…) the Sorbetto. Looking forward to making the Scout Woven T.
Ok…I, like you, have not been at all convinced that this top would work for my figure, which, like you, has curves and b**bs! But, Holy Moly, I was wrong. (Don’t tell my husband I just said that). This top is STUNNING. It’s such a fantastic fit. I’m definitely adding this to my sewing wish list. I just hope my version turns out as nicely as yours has. PS…Sorbetto wasn’t great for me either. This is so pretty! 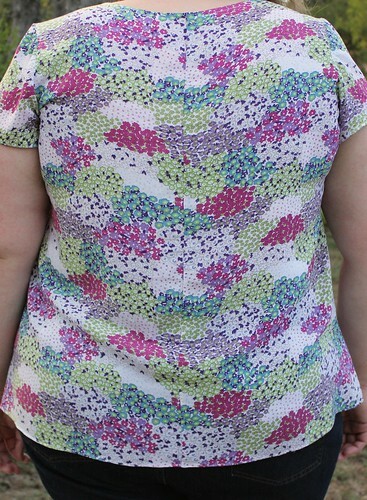 I’ve waffled about buying this pattern too – I have a very different body shape than yours, but I still can’t imagine any woven top without darts fitting properly. So I’m really pleased to read your assessment of the pattern. I think you’ve pushed me off the fence! Yours looks great! 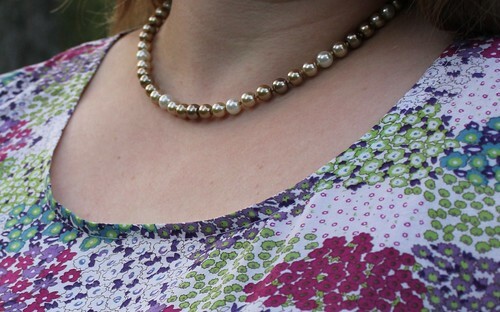 I just love this print and fit on you, Susan. Great job! I love this top on you! I had been avoiding it because I didn’t think a dartless top was going to look good on me – but my figure is similar to yours and you look fantastic! Now for a newbie question… how do you do a 4″ dartless FBA? All of the fitting books I have seem to want you to make a dart. Any help you can give will be greatly appreciated! Thanks for the quick reply! I’d love to see a tutorial if you get the time.